You can't beat a cardboard box, doesn't matter how many expensive presents you buy, your kids will always gravitate towards the packaging that you intend to throw away. So what goes well with a cardboard box? The Cardboard Box book of course. 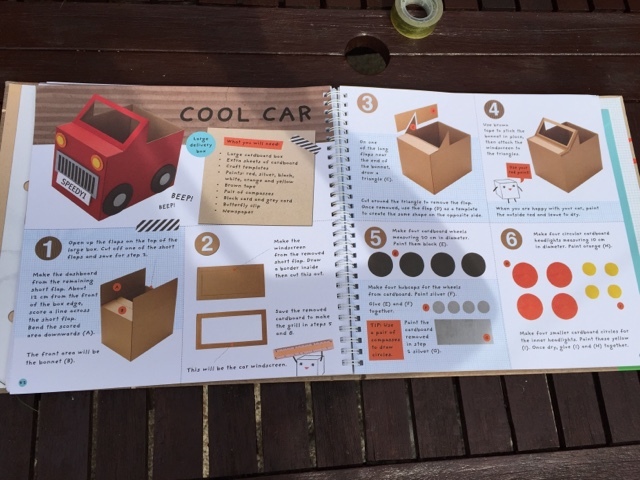 Make a plane, an oven, a car or even your own city inside this imaginative craft book where a cardboard box is not just a box. 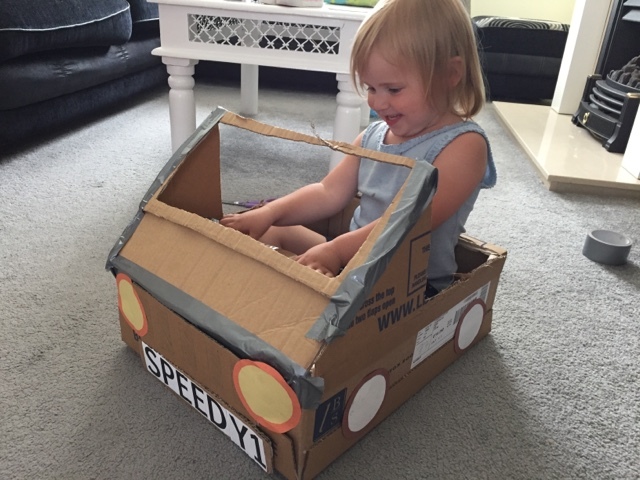 My children have always had the ability to create many things with cardboard, no box is left untouched. 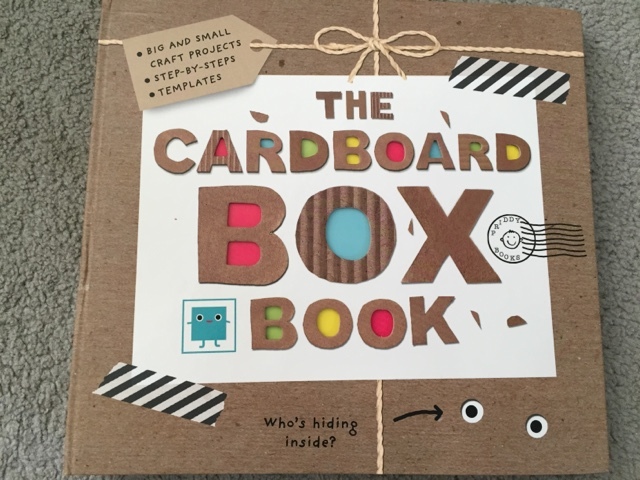 From cereal boxes, to toy packaging and of course the oversized delivery boxes that are forever turning up at our door but the lovely people at Priddy books have proved that they really do come up with big ideas for little people with this book. They have thought outside of the box (pun intended). 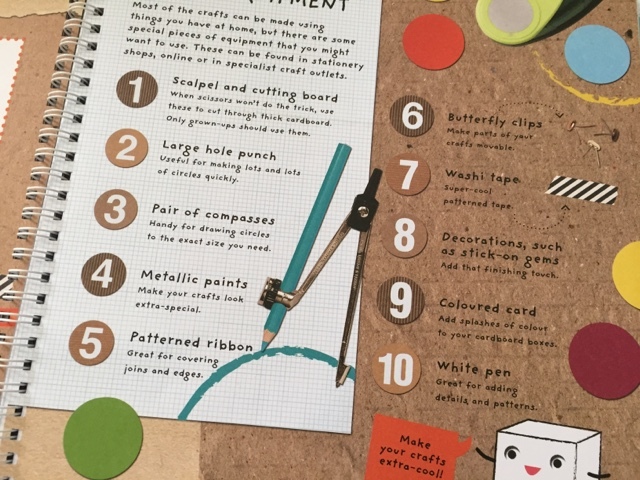 Inside of the pages of this book we meet boxy who introduces you to all the equipment you may need when tackling these projects from the basics to the special tools like metallic paints and washi tape. And at the back you will discover templates ready to help add those details that will make your projects look more realistic. Each project is layed out step by step, even the bigger tasks are easy to follow with the mix of text and images but the end results are all just as satisfying to see. Every one uses different size boxes, you and your childen get to recycle in the best way, by getting creative. These creations can be made independently or in a group, a brilliant way to promote team work! 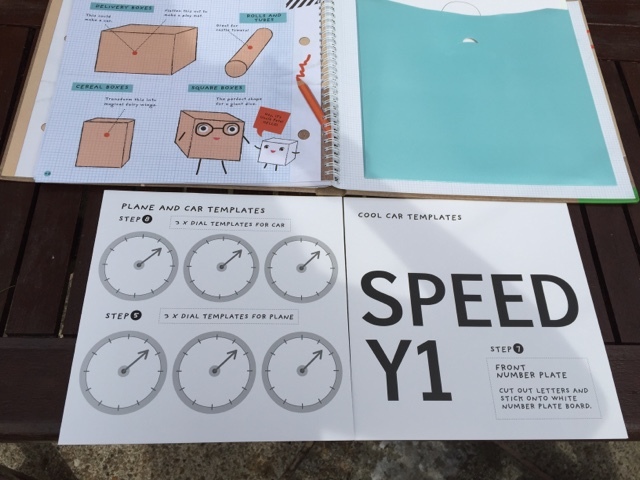 Our first project was the cool car. 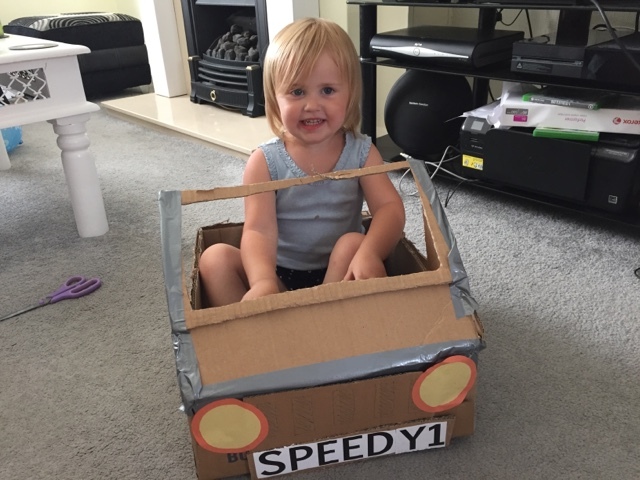 My eldest and I worked together to make a tiny car fit for a tiny girl. With moving steering wheel and cool number plates, the only thing that was missing was the paintwork (we'll add it later). Between the time making and the time playing in the car once made, plenty of hours were passed without us even realising. And of course with the basic design now available to us we can make cars of all sizes, we might even progress to lorries. 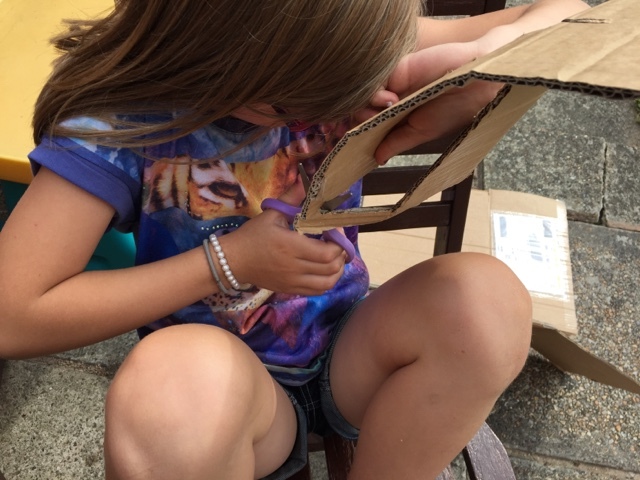 This book gives kids and adults the ideas and tools to expand their imaginations further, showing that you don't need expensive toys to have fun. A great aid to pretend play. Now if you like the look of this fantastic book you can enter the giveaway below to try and win yourself a copy. Giveaway is open to UK residents only and will close at 11.59pm on the 13th September 2015. Please make sure to enter correctly as all entries will be checked and verified. I'm creative and so are my two girls. They have a set of craft drawers full of crafty materials so there is always something for the to make a do. They love jewellery making at the moment and making brooches from a kits I bought for them. pretend play, painting, junk modelling - lots of diferent ways! My son loves drawing & colouring. My girls like getting creative with Play do at the moment. They love drawing, painting with brushes, potato printing, I encourage them to make cards for family birthdays too! With paint, boxes from the recycling bin and his favourite item: GLITTER! They love painting and making things out of old toilet roll tubes. My 2 year old loves colouring and painting. And of course glueing and sticking!! My 2 younger kids love to paint and draw and make cards. My older two love to make models. My kids love getting creative, especially if its messy, we made lifesize cardboard cutouts this holidays and then we painted them, there was as much paint on them as there was on the cardboard!!!! I give my daughter paints and she loves to do some good art. Wow this looks so cool! We often have cardboard boxes and tend just to pretend they are houses or boats. 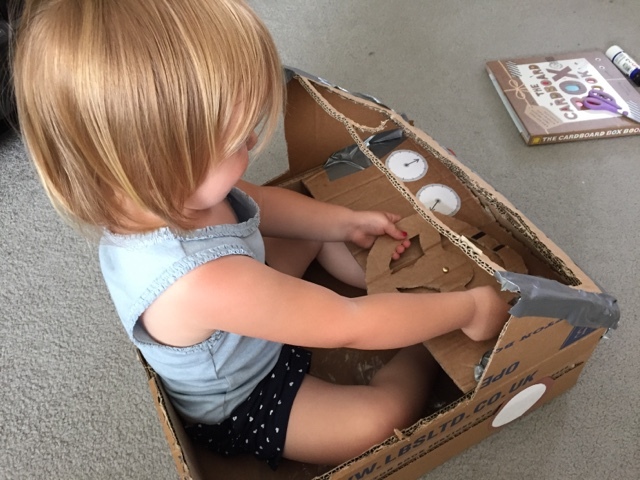 My youngest stepdaughter loves making things out of boxes, we've had a dolls house and a pirate ship created during the summer holidays! They LOVE junk modelling- everything gets saved in our house to be turned into something else. They also love cardboard boxes- my husband came home with two huge ones from work today and you would have thought he had come in with a really special gift- they were so happy! I like to let them open the parcels they arrive in. My son loves building things with lego. I get out the paints and wallpaper lining paper and leave her to it. My 3 year old is just getting into play dough and stickers. She enjoys moving around the old wall stickers in her room. Start making something myself.....then they just join in. My daugher uses , paper, pens & pencils. We have some big boxes filled with stickers, feathers, sticks, straws, glitter, paper, tissue paper, pipe cleaners, all sorts of things. The little one is into cutting shapes out of paper at the moment and making scenes out of stickers and paint. I grew up with Blue Peter and Art Attack so it's an enjoyable way for us both to pass the time, we've got some fun crafts coming up for Halloween! They have 3 stackable craft boxes filled with everything they could possibly want but Nooooo - they want the rubbish! !